In most cases, your age alone does not determine whether orthodontic procedures are ideal for your needs and goals. In fact, I’ve had patients in their 70s undergo Invisalign® treatment! Invisalign® is a very popular option, particularly among adult patients, since it offers them the ability to discreetly correct teeth misalignment without the need for uncomfortable metal braces. Your candidacy for a treatment like Invisalign® is much more dependent on the severity of your orthodontic concerns and the current condition of your teeth and gums—age will have little (if any) impact. Many adults think that, once they’ve hit a certain age, it’s too late to have their teeth straightened, fix an overbite or underbite, or correct some other kind of lifelong orthodontic concern. But it’s just not true. Fortunately, more and more adults are realizing that, with treatments like Invisalign®, they can avoid the aesthetic pitfalls of having braces placed on their teeth and still achieve a winning new smile. Invisalign® offers a unique way to correct common orthodontic concerns that can be of particular benefit to older patients. 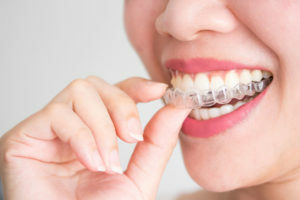 For one thing, the aligners themselves are made of a clear plastic material and contain no metal or mechanical parts, making them more comfortable than metal braces and virtually invisible on the teeth. For another, the customized aligners can be removed while you eat, drink, and perform your daily oral hygiene routine. As long as you keep them in for most of the day, the aligners should be able to gradually and successfully move the teeth into a more desirable position, addressing misalignment issues and making your teeth appear straighter and more uniform. The overall Invisalign® treatment process may take a bit longer for adults since their jawbones are more dense than adolescents; however, this may not be the case for everyone. The length of treatment and the number of aligners required is ultimately dependent on your current orthodontic condition and your goals for results. Regardless of whether you’ve just celebrated your 18th or your 80th birthday, treatments like Invisalign® may be an ideal option for your needs. If you are considering orthodontic treatment, please don’t hesitate to reach out to our practice for a consultation. I’ll be happy to answer your questions and help you determine how you can achieve your goals and renew your smile.